The Woolworth Buyers showed lots of ingenuity in developing product ranges that could be made and sold cheaply, yet have great value to customers. 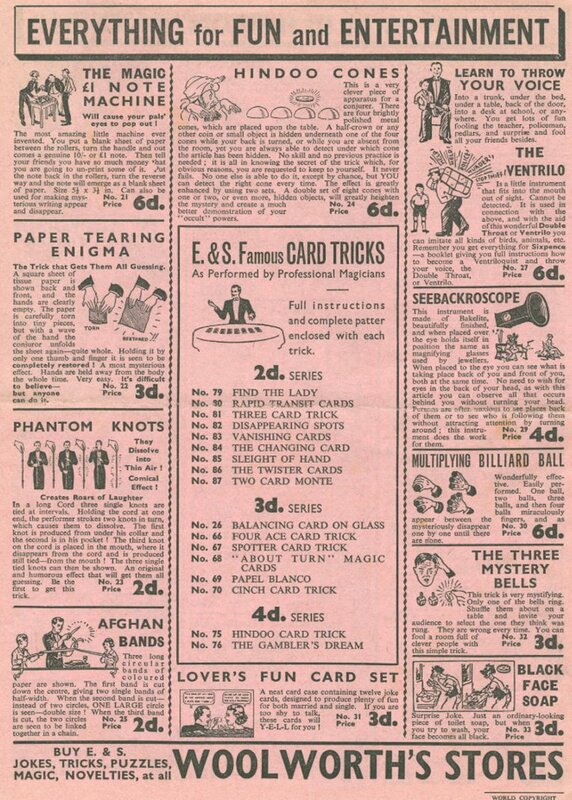 The smash hit of the toy department was magic tricks. When a handful were listed to the stores they sold out in hours, with many branches noting there was demand for more. As the weeks went by the Buyer got increasingly adventurous, adding ever more complicated tricks, illusions and brain-teasers. They were snapped up by a generation of would-be magicians, who kept the instruction sheets a strictly-guarded secret and practiced for hours in secret before revealing their latest masterpiece to the rest of the family. Dads and Mums were every bit as likely to be the magician in the family as sons and daughters, as the popular range contributed to hours of family fun, and more than a few groans when it all went wrong! 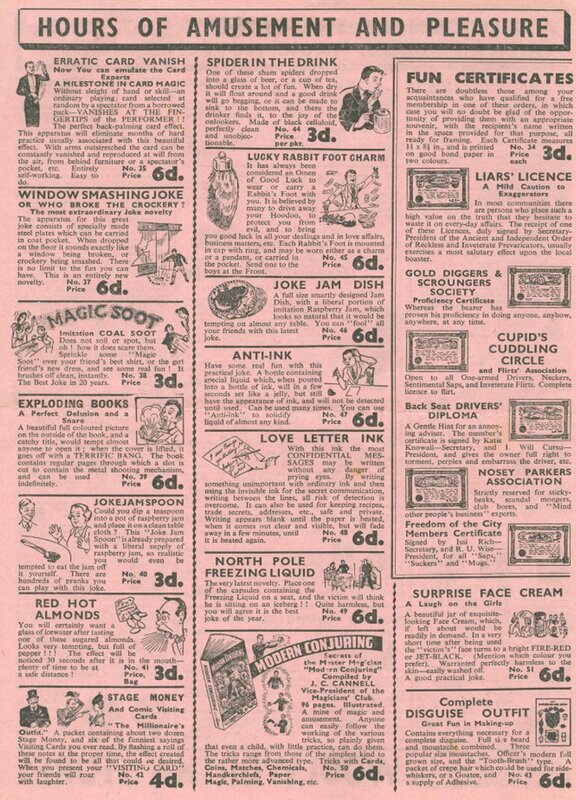 On this page we show some of the original advertising, detailing the wide range of items that were available from the High Street stores during the 1920s. In the 1920s and 1930s Woolworth built a strong following for its magic tricks. 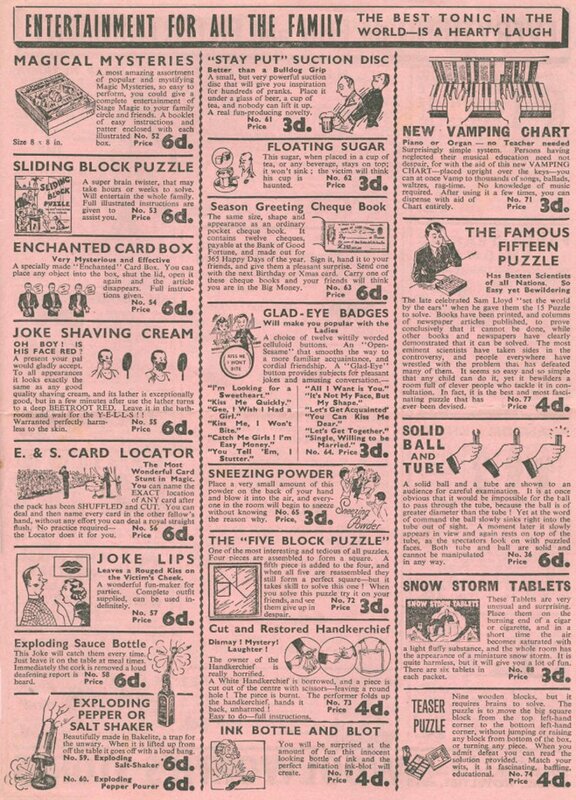 The items were imaginatively designed and simply made, with some designed for conjuring tricks and others for practical jokes. Mass production kept the price unbeatable, with every item sizpence or less, at the time just 2½p or 10¢, or around £2.11 or $1.80 today, and a good selection for just threepence, half thiat amount. 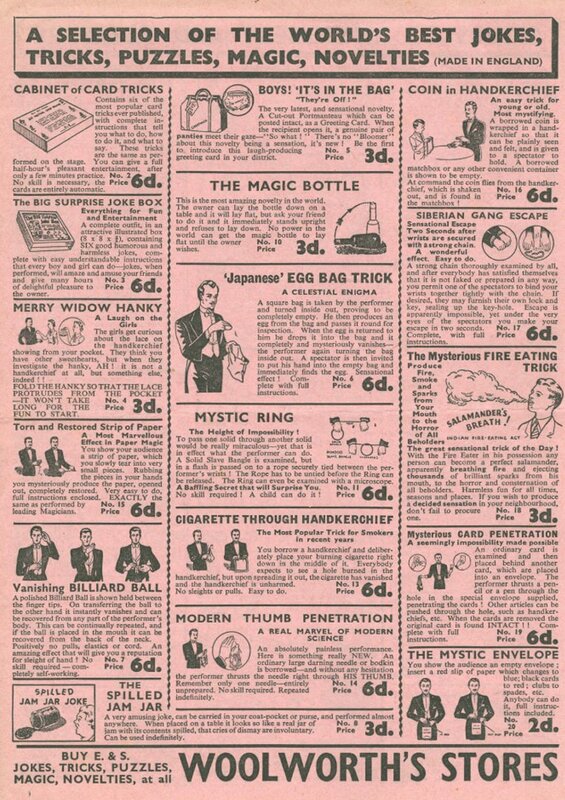 Every now and then the supplier paid to advertise the magic tricks in the press, and supplied leaflets for the stores to hand out free of charge. We have one of those four page brochures, which you can see below, or,if you prefer, you can download and print a PDF version Some of the tricks look old and quaint today, but many would still be as impressive in the 21st century as they were almost a century ago when our great great grandparents first tried them out.